Get your garden ready in advance of the summer entertaining season. The color, textures and overall natural beauty of a garden go a long way in creating the proper ambiance for a summer garden party. Here are four ways to get your garden ready for entertaining friends, neighbors and family. The garden should look established, lush and natural but have a pleasant, manicured appearance. Trimming and pruning the day before a garden party is as obvious as a haircut on the day of a special event. Instead, do all of the necessary trimming, pruning and other maintenance a few days to a week before the party, to give your plants just enough time to grow back to an aesthetically pleasing state. Lawns should be cut the day before the event, to minimize grass staining on your guests’ clothes and shoes, as freshly-cut lawn releases more of the staining oils than regrowing lawn. Use propane-powered devices at the garden’s edge to draw mosquitoes away from the crowd. Light the citronella oil torches before sunset. Barrier sprays on the foliage at the garden’s perimeter will also deter mosquitoes that can ruin an evening garden party. If stinging insects such as hornets or fire ants have built nests in your garden, be sure to hire a professional exterminator to rid the area of their presence before entertaining begins. Most other wildlife will not be a hazard to guests. 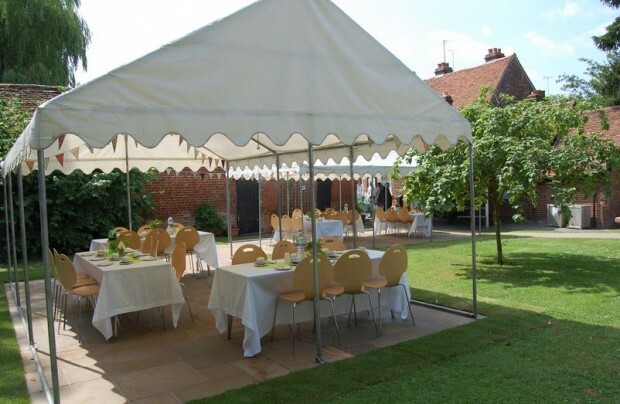 Guests should have enough room to gather under a roofed-over structure, whether it be permanent or temporary, to get out of the sun or rain. If it is very hot, set up some electric fans to circulate air. If it is cool, use outdoor liquid propane-fueled area heaters. Garden centers offer lightweight metal-framed structures that can be semi-permanently erected in your garden. They are covered with lightweight canvas, and they usually come with screened side panels to keep out mosquitoes and other insect pests while entertaining. Installing a small garden pond makes for a grand focal point to accentuate any garden—this is a relatively simple undertaking, requiring only a few hours of labor for simpler ponds. A pond water pump, an essential part of any water feature, will keep your pond water from stagnating and able to support marine life. Consider adding to your water feature a few koi—these fish are quite low-maintanance and will live for several years, providing a splash of natural, exotic beauty to your garden. A fire pit is another great focal point for people to gather around. It is like having a campfire at home for every evening spent with friends outdoors in the garden. Propane or natural gas fire pits do not require removal of ashes or wood fuel, and they are easy to light and immediately extinguish. Outdoor garden entertaining is becoming wildly popular. Most homeowners today are setting up some sort of outdoor entertainment space. Some of these outdoor living spaces rival the comforts and amenities of what is available in the home. A little planning and thoughtful purchases can make your garden a special place for family entertaining.